I have been using Access and VBA for a few years, without any formal training in relational database or programming. In this concise book, Steven Roman managed to give a strong foundation in the theory of relational databases, VBA and DAO. Armed with this knowledge, I now have the confidence to dig deeper in these three topics and study more advanced material. One downside though: I found the last part of the book on ADO quite confusing. Steven Roman prefers DAO to ADO and it shows. I nevertheless give the book 5 stars, as the first three parts of the book are stellar. In seeking out materials to train myself on Access 2003, I have found several books that have done adequate or good jobs of teaching the program. Most of them, however, did not do so well on teaching database theory or on instructing in how to use the native programming environment. This book helped to fill in the gaps. It is not perfect but it certainly was a good place to start. The treatment of database theory is just that. It is a treatment of theory. It explains the concepts in a semi-rigorous manner which is dry but still informative. The notation is sometimes a trial to follow but that is the nature of the beast. When things are put in terms of equations, they just do not read as interestingly as a prose novel. Although this information is presented with Access in mind, it would be applicable to anyone who wants to learn about databases. The treatment of the programming elements is no less dry but it too is informative. Again, reading lines of code does not strike me as an exciting way to pass the afternoon but it got the job done. The examples are as clear as the syntax allows and make the points well. I should point out that I did not actually try the code presented in this book. I read the examples to learn the concepts. I cannot testify as to how well the code worked in a "real" environment. While I will certainly be looking for other references and learning materials, this was a good choice for my first foray past just learning the basics of the application itself. Years ago, I've picked this book up to learn Access... 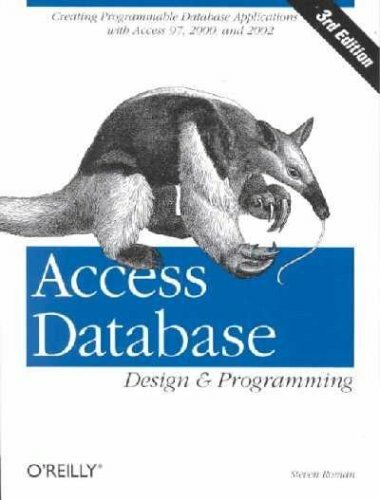 I haven't used Access for quite a while now (mostly an Oracle person now), but I still have fond memories of this book.Not only does this book teach you Access, and it does that very well, it also go through the database fundamentals. An overall great book, imho. I first read Steven Roman's book on Access a few years ago when it was written for Access 97. I recently bought a copy of the current version as a reference. What I liked about Steven's books was that he took seriously his coverage of normalization, which is rare amongst books on Access. If you're new to database programming, you need to learn the basics of normalization. In my experiences, I've come across a lot of databases designed by beginners that exhibit a "spreadsheet" type of understanding towards Access tables. The beauty of the relational model is that once you have your database set up, ongoing maintenance is minimal. If you learn how to program Access, but don't learn the basics of normalization and the relational model, you may as well just keep your data in Excel spreadsheets. My complaint with this book is his coverage of ADO. The author clearly prefers DAO for MS Access, and he states as much, and his coverage suffers. He covers the material, but he makes using ADO appear to be very difficult. In an entire chapter on ADO, he fails to show the user the most basic thing: how to generate a recordset for a table in your Access database. 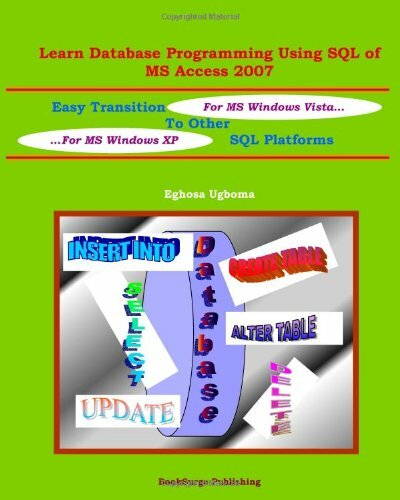 Instead, he shows you how to use ADO to query other databases, such as SQL Server and even Excel, but not the Access Database that you're currently using. In DAO one of the fundamental details that you need to know about is the CurrentDB object. Steven gets a gold star, because he not only covers the CurrentDB object, but he spends 6 pages on it. In ADO, an object that is used for a somewhat similar purpose is the CurrentProject object. You won't find coverage on it anywhere in this book - just check the index. Perhaps the author's surreptitious goal of the chapter is to frustrate you so much with ADO that you will return to DAO, his preferred choice. Tsk, tsk Steven. After reading the books section on ADO over and over again, I cannot recommend this book if you plan on owning only one Access book. Instead, I would recommend Alison Balter's Mastering Access Databases. It is the best Access book on the market(as most Amazon reviewers will attest to) and covers nearly ever topic that you'd want to know about Access. Even so, Steven's book covers normalization so much better than the other Access books out there that I would advise serious Access programmers to buy two books: Alison's and Steven's. Note to Shannon - DAO is not a problem. I haven't read this book, yet.But, reviewer, Shannon, complained about not being able to get it to work with DAO. The problem is in References.Her database is probably set with a reference only to ADODB. 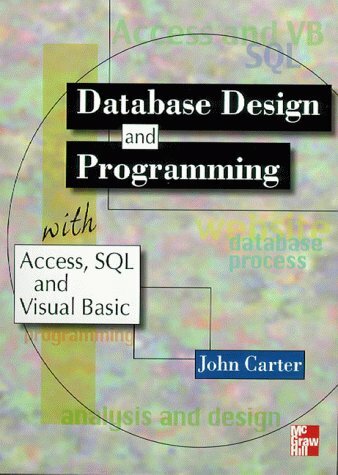 gets the job done ----jeff s.
If you need to get up and running this book can do it.Should have an understanding of SQL and databases.No great depth, but a good 'how to'. It's 177 pages that get you up and running with Access. If your looking for depth this isn't the one.You should have an understanding of SQL and databases to get this information working quickly for you.It hits lots of high points to get you started and gets you through the Access maze. This book took forever to ship.. was not pleased that there was no expedited shipping option either. How hard is it to find a book and ship it in a timely manner?!! This book is very easy to follow for non expert programer. I recommend for those who want to start learning VBA. 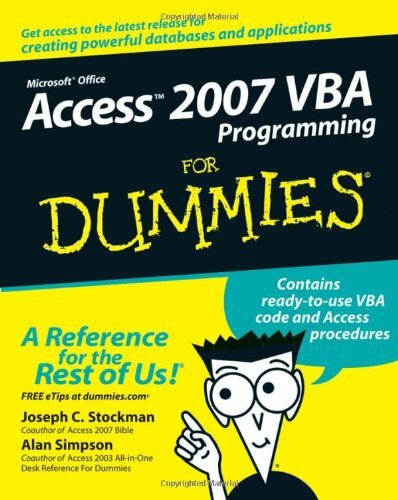 I own several books on Access 2007 VBA programming, as any programmer would.In hindsight this has been the most valuable resource in adding actual, real world functionality to my applications.It is concice and uses lots of how-to examples.I do not normally like the "...for dummies" books, but this one is a keeper, big time. did not realize that this was for programing.Returned it and bought the real Access dummies workbook to start with instead. 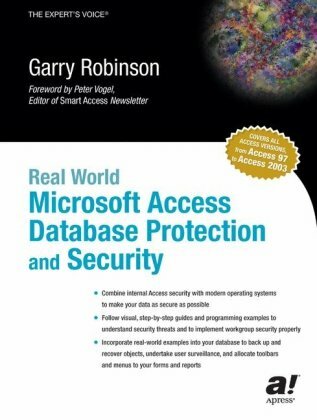 Author Garry Robinson approaches this book differently than other Access books on the market: he keeps the focus on issues that will help protect your database. Written from an experienced developer's point of view, he discusses protection and security task-by-task. You'll learn to hide tables as system tables, produce databases difficult to crack, and back up databases. You will learn how to keep staff from viewing salary tables, prevent customers from peeking at your distributed software design, and become a better judge of worthwhile security options (versus time-consuming choices). A learning book; not a reference one! I was buying the book to guide me in creating workgroup and user roles to enhance security. The book has a lot of information, and one would have to be specializing in access security to really benefit from this. It requires one to read through a whole chapter to move one step closer to securing an application. It required me to read the whole book to make sense of what I should use for my application; which eventually did not work as great as you'd expect after so much reading! It is the most intense book I know on access security, but not a reference book! Recommended for those who want to learn Access security, but not a book to use for reference. I found it to be a good rescouce of the various stages of MSAccess DB developing protection for a data base. The end user would also benefit by having a reliable data base. This was a great find.I just wish I had read it sooner.There are things in here that every Access developer should read.Lots of good advice, techniques, and code samples.Very well-written and easy to follow.Right to the point.I especially appreciate the humility that Garry shows in his writing.He obviously knows more than most about Access, yet he gives credit where it is due and provides lots of links for the reader to go out and get the background themselves. I have read some of the other (excellent in their own right) big books on MS Access, and there were a couple of "non-security" things in here that I did not find elsewhere (not to mention the security issues that were new to me).I highly recommend this book for anyone who may be creating a multi-user database. 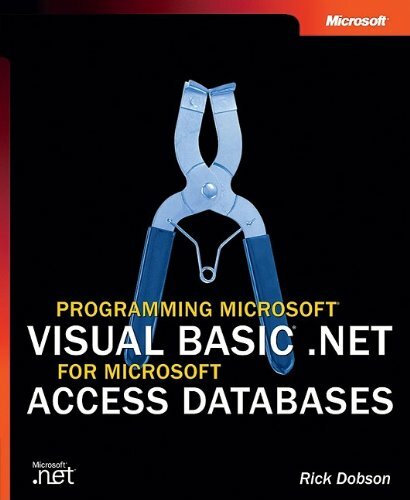 I have been working in this profession for 30 years and have migrated from COBOL to VB-3, to VB-6, and now to VB.Net.The title of this book is "Programming Microsoft Visual Basic.Net for Microsoft Access Databases." When I started reading the book it began with very basic VB for the first 128 pages.Then once you do get into the VB sections of the book, there is a lot of repetition and not all of MS Access/VB programming is covered.Everything is done using embedded SQL commands.No raw access to MS Access.Try and find an INDEX change,or a SEEK command. Rick, you should publish a second book and finish the topic and send it to everyone who purchased this book free. A book that does what it sets out to do. As I read the review that compained about the heavy use of ADO rather than ADO.net in the first part of the book, it seemed to me that the reviewer missed what Dobson was trying to do. This book really teaches two subjects--VS.Net and ADO.Net as it applies to Access. I appreciated that he used the old familiar ADO while discussing the new, unfamiliar VS.Net, and then, when the reader should be comfortable with the first topic, began to teach the second. I think he did a good job of laying the groudwork for using Visual Studio.net before then introducing the complex topic of switching to ADO.net. I would recommend this book for anyone transitioning from VB or VBA to .net using Access databases. there is more written on ADO/ADOX than there is about ADO.NET. in EVERY .NET book! Write a "Beginning .NET" for all that stuff and save your readers some time! emphasis on database programming (albeit with the "old" ADO stuff). In short, I'm glad I bought it used for only $10. The target audience for the book is, quite simply, Access developers who are accustomed to VBA and/or VB 6. This book serves a good purpose, as the .NET materials I have seen to date all refer to SQL Server in their examples; they acknowledge Access, but fail to show its uses. I am not crazy about seeing "old" technology such as ADO used in some of the examples, but for a book of this nature (transitioning between coding languages) I guess that is inevitable that some old/new information would be included at various points. Do not purchase the book if you're intending to use the built-in VBA capabilities of Access or other Office applications -- that's strictly not covered. What you will find, though, is a good sense of how VB.NET operates on its own, and how to create applications that draw upon the data stored in your Access databases. This should be a good base point for someone who's developed in Access, and wants to investigate moving forward; it should be a means to an end, rather than the destination itself. Additional reading on ADO.NET and classes will be helpful, I believe, to continue fleshing out knowledge to be truly effective in your work, but this book does a good job of introducting those concepts. In particular, the chapter on Arrays.Most books skip this topic entirely or will have a page or 2.This has an entire chapter on it, with many "complete" examples, and the reason I bought the book. This may, in fact, be the definitive reference for arrays. But there is a remarkable error in that chapter, which describes how, for 2D arrays, the first index is for rows, the second for columns, such as Array(rowindex,columnindex).But I discovered, after a few hours of confusion, that it's the other way around!The problem is evident from the continuous "out of range" errors I was getting. I had to print.debug almost every cell in my array to confirm this. Also, the SELECT statement in the example that uses the GetRows Method to fill a 2D array (ironically not in the chapter on Arrays) should include the ORDER BY clause, so the data in the array will be in the same order as in the table from which it's importing. I was printing the table, for reference, but the array was, not obviously, sorted in a different order!For sure, the code in these books often doesn't work, but I'm sure it's hard to proof all the code, since typos in code just aren't as obvious as with regular prose. I'll keep this brief: It's a pretty good book, but doesn't cover everything.For example, OpenArgs is not mentioned at all. I tried this book because I thought it would be a good book which would teach me, a complete novice, how to program in Access with VBA. Not only were the fist few pages of this book complete garbage, half of the exercises in the book don't make sense or have code that works. I stood there frustrated for hours trying to understand why the code in the book doesn't work the same way when I tried the exercises. I don't know how people are giving this book 5 out of 5 stars, but they are completely wrong. DO NOT USE THIS BOOK FOR VBA!!!!! I haven't tried this whole book out yet, but I do know that it's not all that it's cracked out to be. This is not a book for beginners but if you want to learn the in's and out's of Access VBA this is the book for you!I bought 1 for work and one for home.I use the examples everyday. 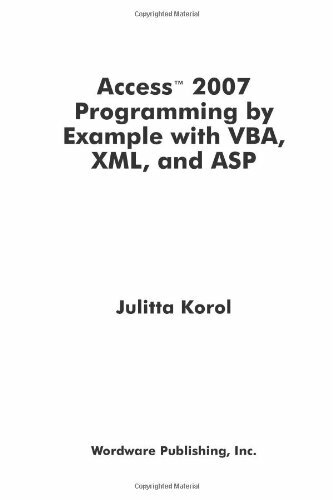 I have been trying to learn how to program Access for a few years and this is the only book that I am confident will help me master programming Access 2007.I purchased the Access 2003 version last year and then the 2007 Access a couple months ago.To my surprise, Ms. Korol had added more than 200 pages to ensure that folks understand how to use Access 2007's new features, including the Multi-value Data Type, Attachment Data Type, Append Only Memo Field, Rich Text Memo Field, and PDF/XPS files. Although I have not studied it yet, there's an entire chapter on customizing the Ribbon. The very best aspect of the book is that it contains code samples for just about everything that you'll need to build a robust Access application.Most code samples are given as both DAO and ADO. Try Martin Fowler's Patterns of Enterpise Application Architecture. It has much better coverage in more useful context. The book presented 25 patterns grouped in 5 areas, decoupling (conceptual and architectural level), resource, input/output, cache and concurrency. The most interesting patterns are in resource and cache. Decoupling and concurrency patterns (e.g., data accessor, active domain object, layers, transactions, optimistic/pessimistic lock etc.) are well known and the contents are a bit too light to be very useful, yet the concepts are giving readers some directions. In resource patterns, some interesting patterns are presented, particularly resource timer automatically releases inactive resource, retryer enables fault-tolerance for data access operations. In cache patterns, cache collector purges entries whose presence in the cache no longer provides any performance benefits; cache replicator replicates operations across multiple caches. There are some areas to be improved, first, author should consolidate pattern names with other pattern authors, e.g., data accessor is also known as data access object, active domain object is similar to active record,paging iterator is close to value list handler (though value list handler is more decoupled from underlying data store), the point is, one of the important benefits and purposes for documenting patterns is to build common vocabularies among designers, using different names for same or similar patterns is defeating this purpose. The same pattern name should be used and may be presented as a variation of the original pattern. Secondly, the examples given in the book is a bit too simple, sometimes, the examples might not justify or validate the interface abstraction is generic enough to handle real world problems, so some tweaking and modification to the pattern would be expected. Overall, the book is well organized, and contents are easy to follow, most patterns come with class diagrams and sequence diagrams. Good for designers who want to decouple data access from rest of the application, utilize cache to minimize data access and thus boost application performance, manage resources in an efficient and leaking-proof way. I'm in the middle of developing yet another persistence framework for a client, having done it a couple of times before. Each time I refine my ideas about how to do it. I must say that this book has a thorough examination of issues and certainly food for thought as well as answers to a couple of questions I've had. However, I wouldn't say it's a complete design (which it doesn't claim to be). I still found myself picking and choosing which patterns to use as is, which to modify to my liking, and which to discard. Also, I was left with the impression that the book didn't give enough coverage to handling collections of objects. The material is mostly geared toward working with a single object, which is understandable. I just think it would have been helpful to have more discussion about handling collections. For example, what should happen when you request to load an object, but the criteria you passed to the loading mechanism results in data for more than one object being retrieved from the database? Hand back the first object? Raise an exception? If it's covered in the book, I missed it. Further, I would like to see more discussion about WHEN to refresh an object from the underlying database and when to save to the database. I always struggle with that timing issue. Having studied EJB, I like how entity beans keep your bean in synch with the underlying database. But the EJB container intercepts calls and makes those things happen. When coding the persistence layer myself, that's not an option. So, again, this is something I'd like to see some light shed on. Overall, though, a great book if you're interested in reading up on persistence layer patterns. Good design pattern book in data access !! I am in the process of writing a thesis proposal that utilizing JDBC and TableModeler to access various database platforms as a prototype. While prototyping the model, I encountered a lot of consideration of what is the best approach for certain implementation (mainly on JDBC). 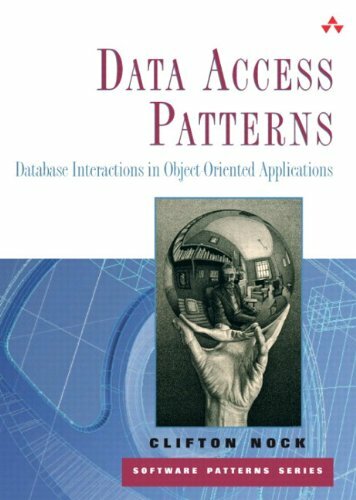 While looking into a few of designing books, I found this Data Access Patterns book that fits into my research needs. I have read other book such as Designing Flexible Object Oriented System with UML and not able to apply the concept or see solution in it. It is simply a conceptual book. No practical examples at all. 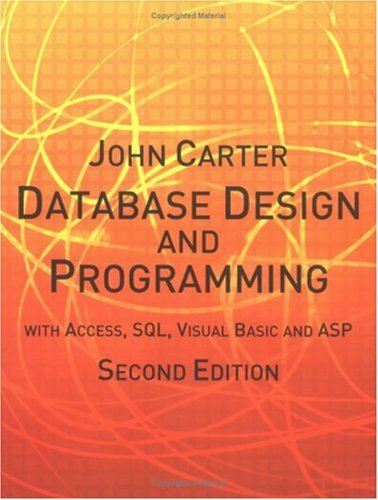 Mr. Nock has explained the design patterns very clearly in each chapter by using JDBC as a media. The examples are very easy to understand as compared to Design Patterns Explained. I am not able to understand codes that implementing graphics in that book. Mr. Nock addressed the pros and cons of the patterns. Many techie books do not even bother to talk about pros and cons. The author has chosen the right title for the book, I realized that many times author received a poor rating because reader expect different contents based on the title of the book. The feature I liked the most - the ¡§Applicability¡¨ section on each chapter. Unlike other patterns book, the author explains the concept and gives example of "what" and "when" to use certain design pattern. This section is pretty much the answer for my thesis obstacles. The answer is in this book!! Minor typos do exist such as in page 390 roll back instead of rollback. In concurrency chapter, author may have mis-used the term of updates locking. It should be Lost Updates instead of Missing updates. Concurrency chapter looks like UDB Lock Concurrency architecture. Additional note - would like to see the quality aspect in each of the patterns. Overall, the book is very well structured, explained and thoughtful. Thank you Mr. Nock ! !This is a perfect book for my thesis. Looking forward to read your future publish. I have to disagree with the previous review.I will try to explain why I think 'b88zhou' review is inadequate after presenting my overview of this book. After reading numerous pattern books, it is nice to see a pattern book with very good organization. Each pattern is presented with the following subsections. * Related Patterns and Technology. I specifically like 'Consequence' section because it outlines the 'bad' consequence of adopting the patter.This goes with the mantra of design patterns - there is no one good pattern.You trade off one design for another depending on the context of your domain. Also each pattern is accompanied by UML class diagrams and UML sequence diagrams - this is a big plus in understanding pattern. Specific to what the previous reviewer say - here are my rebuttals. >> Why do you want to make queries and database updates into factories?Looking at the sample code, does it really help decoupling? The previous reviewer mentioned as 'factories' is the derivation of 'AbstractFactory'.If you do not understand why AbstractFactory aids in decoupling from the concrete implementation, I think you should re-read GoF book.The author usesAbstractFactory pattern extensively in context of "Input and Output Parameter" and "Cache Patterns".I do admit that sometimes "Input and Output Parameter patterns" may not need to use AbstractFactory but if you read 'Domain Assembler' pattern you will understand why.From Domain Assembler, you can see the benefit of having AbstractFactories for Selection, Domain Object, and Update -- assembling all these factories via interface not concrete implmentation - a basic idea of design to interface instead concrete implementation. >> The "Cache Patterns" does not solve the problem of preventing stale entry or even attempt to describe how to invalidate cache entry, so no matter how efficient you get, the cache is not guaranteed to be up-to-date /correct. Please re-read 'Cache Collector'.The pattern could have different name like 'Cache Garbage Collector'.He talks about how you can 'purge' old data.Also re-read 'Cache Replicator' for how to sync the cached data in distributed system. >> I'm surprised "stored procedure" is not mentioned at all. I guess you have not done too many DB oriented projects.The stored procedure is evil and add little value to OO programming.But if you want the stored procedure, just replace 'SELECT' or 'UPDATE' statements to whatever stored procedures you want to call.So I don't think you can add much with SP. This book is not about Java Data Object or OR mapping.Object-Relational mapping tool is another beast. 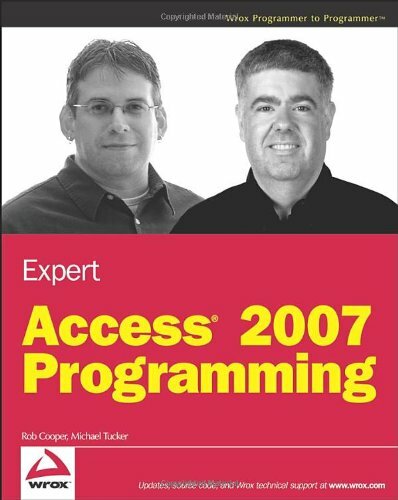 Expert Access 2007 Programming shows experienced developers how to create professional-level Access database applications. The authors—software engineers on the Access development team at Microsoft—show how to apply software engineering methodologies to Access application development. The book is organized to cover all phases of Access development. When they say expert programming, they aint kiddin around.Most of this book is going to be over the heads of anyone without a degree in computer science.Much of the examples are so obscure and narrow in scope that I don't see myself ever using 90 percent of them.However, I have found use for the remaining 10, which makes this book very worth the purchase in my opinion. From the back cover: "You'll quickly learn how the 2007 version makes it simpler to write quality Access applications with XML, C#, and other .NET languages that are actually fun to write, feature rich, and easy to use." But almost all of the code is in visual basic, a language that's not fun to write. I'll update this review/rating after going through the book, but I'll never give it 5 stars for that completely misleading sentence on the back cover. I make the claim that this book will be legendary simply because it covers so much and presents it so well.I am sure MANY will use its wealth of information well into the future and beyond Access 2007. This is not the first book on Access to own unless you fairly comfortable with developing applications using another tool. Check out Wrox's Beginning Access 2007 title. But if your goal is to create an application to sell or use within your company this book provides all the info you need to get started and succeed. As a read it I recognized a lot of the tips that I had gathered over years of work and research. Would have been great if I could have just bought this book years ago. Section 4, "Finalizing the Application" covers great material; some knowledge of .Net would be beneficial if you are interested in DLLs (like resource libraries) or the build utility that comes with the book. Next to the Access Developer Handbook series I'd say this is the best book I've read on Access application development and deployment. As I was reading through this book, it became clear to me that this is one book anyone who develops in Access should have. The book is written true to Rob and Michael's form:The content is clear and the information useful.I enjoyed discovering new "toys" in the debugging chapter, and the error logging code is a gem that will be utilized in deployed applications.Going through the Add Advanced Functionality to Forms and Add Advanced Functionality to Reports chapters was like walking into a candy store that carries your long lost favorite childhood candy -- a joy. The ribbon chapter enhanced the knowledge I had prior to reading it.I was first introduced to Ribbon customization while listening to Rob [passionately] presenting the topic in an Access developers' group, and this chapter built on that presentation. 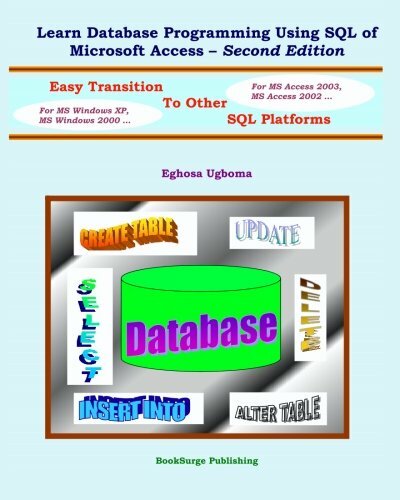 Microsoft Access remains an important part of the Windows developer's environment, in that the doughty database management system represents a simple and relatively straightforward core for forms-based software modules. 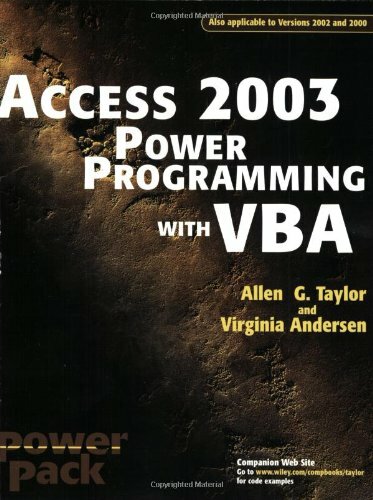 Access 2003 Power Programming with VBA is a resource for programmers (particularly novice ones) working with Access and its native tongue, Visual Basic for Applications (VBA). The emphasis in these pages falls on getting specific tasks done (examples include modifying a stock menu bar, connecting to data sources, listening for interface events, and exporting XML). Other coverage is more basic, and appropriate for Access developers in their novitiate stage. It deals with such fundamentals as declaring variables, establishing control structures (such as loops and case statements), and using the features of the Visual Basic Editor. This is a good reference book for those of us who are not the best at programming. This book is fairly decent, except that the template code for "Connecting to Databases with ADO" (Chapter 15) is riddled with errors.Most of this is probably due to problems with Access versions and configuration, but in any case, templates that don't work are frustrating and useless.There is absolutely no errata information for this book on the Wiley web site, and Wiley doesn't take inquiries, regardless of the notes in the front of the book.Find a different book for Client/Server study. 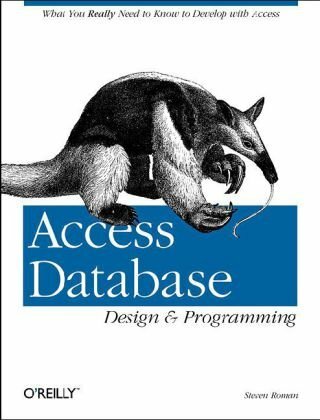 Here is a solid introduction to programming in Access, including how to use some of the built-in features that make VBA easier to use.If you've been using Access to make forms and run quieries you should be able to pick up this book and start programming. Power Programming tells you how to create procedures and functions.The code isn't very useful by itself, but the book explains how things work so you should be able to write your own procedures. There isn't a CD with the book and I keep trying to find a place in the book that gives a website with the code.It would be helpful to have the code available for cutting and pasting since it's so easy to make a typo. If you are an expereienced VBA programmer, You probably want to find another book.I was looking for a book that would help me transition from Access 2000 to Access 2003.This book does not do that.I wish I had read the editiorial review more closely especially the part that says "a resource for programmers (particularly novice ones)" Another good quote from the editorial review is "the odds are small that you'll get all the information you need out of this book, unless the application you want to write is super-simple. "But then you can never get everyting out of one book anyway. This is the best book I have found for VBA programming I have found.It provided answers to a lot of my questions that I couldn't find in other books. Access has undergone an extreme makeover! Whether you've used one of the older versions or this is your first exposure to Access, here's where you'll find the essentials you need to make this database system work for you. Cruise around the new interface, team up Access with other Office applications, use wizards to automate your work, and much more. The writting and verbage of the book is OK but it is near to impossible to read the 'screen shots' of the book. 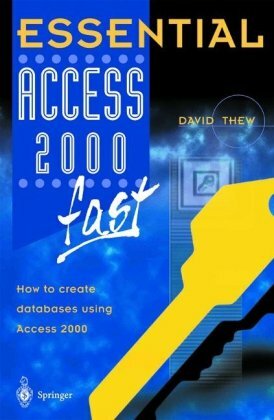 I've seen the earlier "ACCESS 2003 for DUMMIES" and the screen shots are bigger and crystal clear and easy to see and read. I was incredibly disappointed with this book. For instance by page 12, no screen prints or pictures have been provided to support the convoluted language meant for those already familiar. This was a waste of time for me as a beginner. How can you progress if the "techie" language is not further broken down and, demonstrated. Now who is the dummy? This is the second "Dummies" book I've purchased from Amazon. Every book I've ordered from Amazon has always arrived when promised and always in mint condition. As the advertisments for the Dummies books claim, they're an excellent source for reinforcement for what you already know, or an easy to understand and follow book if you're new to the subject. 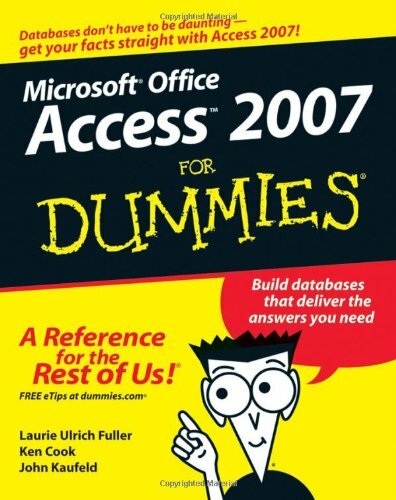 The Access 2007 for Dummies is no exception. I took a seated class on Access and SQL. Access 2007 for Dummies made my understanding of the subject matter complete. The book is a good reference for experienced Access users and I would highly recommend it for the beginner in addition to the text book you're using for the class. My Office upgraded everyone to this version so I had to kinda try to figure out how things had changed until I got this book. Very helpful and a lot less stress.